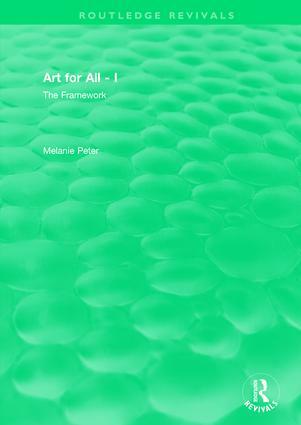 Originally published in 1996, Art for All is aimed at the non-specialist teacher of art, and offers a practical approach for working with pupils with wide-ranging learning needs. It presents a developmental framework for art in the light of National Curriculum requirements, with strategies for structuring and supporting appropriate art activity. It is presented in two volumes with colour illustrations: The Framework, which describes the principles of art education in relation to pupils learning difficulties and The Practice, which deals with the specifics of delivering these principles in the classroom. Whilst they stand as independent texts, they are intended to be used together. Art for All will be of interest to all those working in this and related fields in mainstream as well as special education. Acknowledgements. Introduction. 1. Art in the Curriculum 2. The Art-Making Process 3. Pattern and Texture 4. Colour 5. Line and Tone 6. Shape, Form and Space 7. Understanding and Appreciating Art. Appendix. Bibliography.